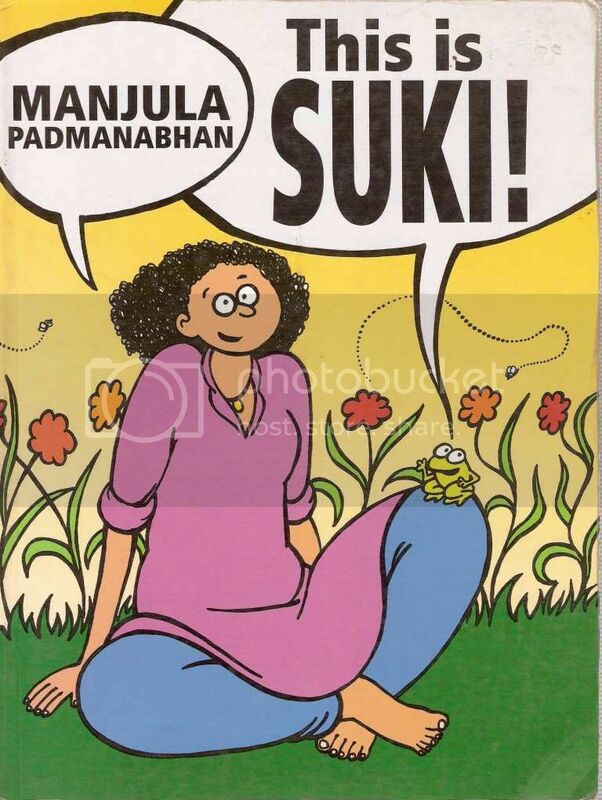 Manjula Padmanabhan’s Suki is the greatest comic you will ever read in India. I was introduced to Manjula Padmanabhan’s work through the Target, the children’s magazine (emphasis on “the”). Now, of course, she’s rather well-known for her play “Harvest”, for she won an Aristotle Onassis award, and for the children’s books Mouse Attack and Mouse Invaders ( I have both, thanks!) Did not get Suki until last year, and oh my god, I was blown away. This strip deserves respect, and a lot of our attention, so go right ahead and check out one of the collections.It’s witty, it’s completely whimsical, it’s exquisitely drawn, and it’s SO Indian! I was lucky enough to find a copy of the original Duckfoot Press release of This is Suki, from where these scans have been taken. Penguin has recently released a copy of “Double Talk: The Best of Suki”, it’s priced slightly on the higher side (Rs 250) and available in all fine bookstores everywhere. 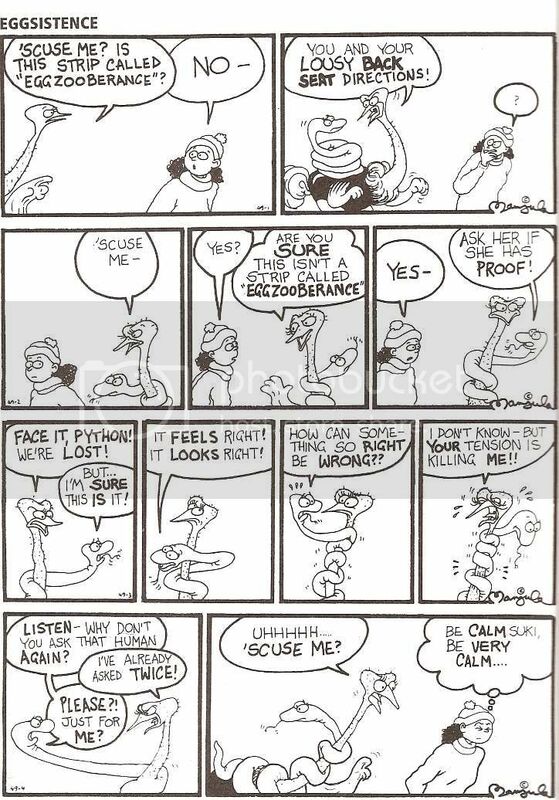 I thnk this was in the introduction to the collection – it seems not too many people “got” Suki when the strips came out, in the Sunday Observer in 1982. So there used to be loads of letters of complaint from readers who would yell at the editor for allowing such tripe to run in the periodical. Grrrr. Stupid, stupid rat creatures. Want to check out more Suki? 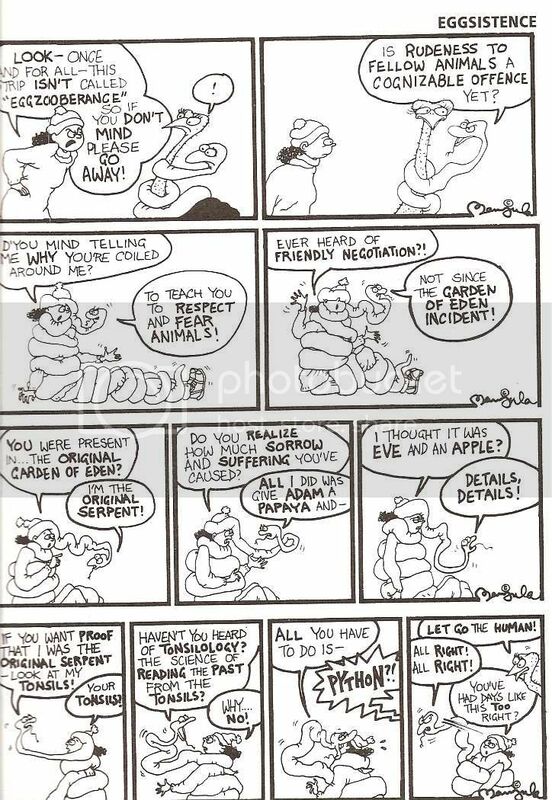 Check out Ms Padmanabhan’s blog, where she posts the occasional Suki strip. 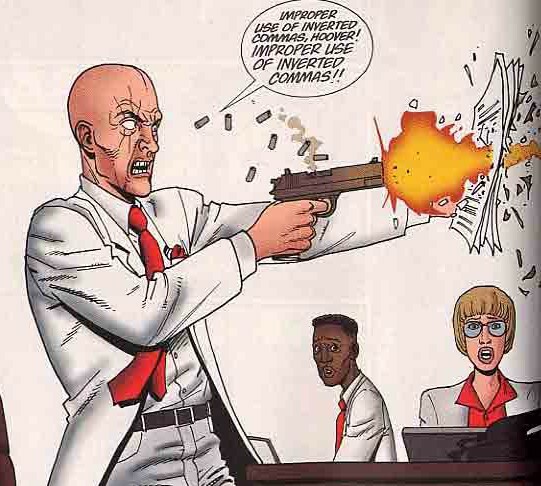 *Sigh* What I wouldn’t do to get one of the original pages…. And just to show you that the lady knows her comics, here’s a slightly-old Rediff article by her about female characters in comicbooks, and her favourite. 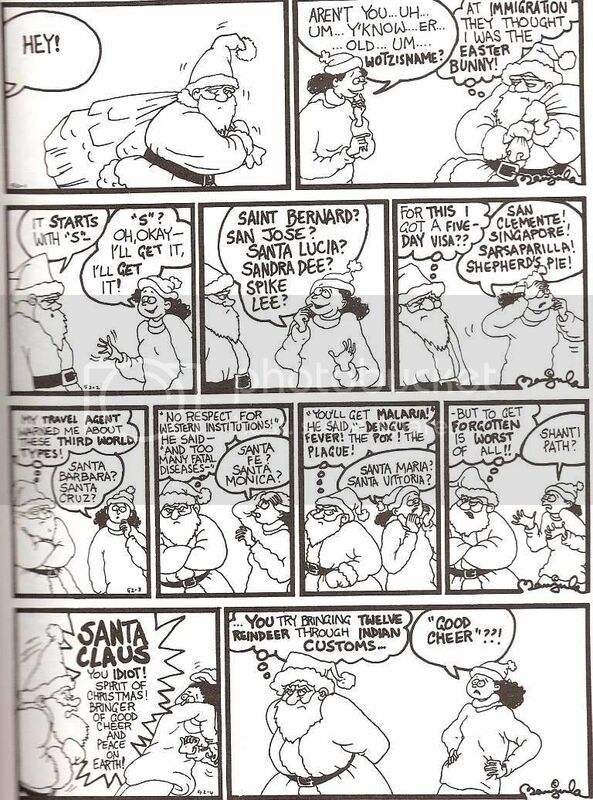 On an aside, another cartoonist I remember from Target was Mala Marwah, who did a strip right below the letters’ page. Damned if I remember the name, will just have to go home and flip through my copies. Anyone know what the name of the strip was? It was something like Baiju-Bawra, or maybe a pun on those names. Speaks volumes about the Indian Comic Strip scene. Indian comic or not, I find it funny though. absolutely funny. Never knew this side to Manjula Padmanabhan. Had only encountered her as an austere and aweinspiring academic. On the contrary, i have never known Ms Padmanabhan as a “serious” writer! :) Haven’t seen/read Harvest. Why that horrifying icon? Kill Bill is it? Oye.. You made my day today.. I was looking for something in my bag and found the dvds you asked me to mail your friend.. As soon as I had realized it was The Ghibli collection, Ah!s and Oooh!s and evil grins followed. I promptly started watching “My neighbor Totoro”, one of the few Ghibli movies I hadn’t seen, and almost instantly fell in love with it. Thank you, Beatzo! This whole mail-my-friend is some kind of insider-joke which only fanboys are supposed to get, like in all those sci-fi movies.. right? You never meant these dvds to be mailed. Did you? This is the entire Ghibli collection you promised to give me. You wanted me to find out later. Thank you, Beatzo! Thank you! Thank you! Dont you just love the cabaret dancer panels? I am really puzzled that the same woman who drew Suki wrote that ghastly “Getting There” and the relatively ghastly harvest. Hmm, Harvest is ghastly? Never knew! Oye, please please PLEASE send the package. I will get another for you, and soon at that. Please please please. you don’t remember Moochwala and Gardhab? Of course I do. But Suki is in a class of its own. Gardhab Das! Had totaly forgotten about him! If you know of more Indian comic strips, do enlighten us please. I went through some of them. Very cool. But the gripe I have with strips such as these ( i.e why I don’t like them as much as I should) is that they are so headline-of-the-day oriented. I mean, if I give this to someone who’s not really too acquainted with current affairs, would s/he really enjoy it? Would I get the in-jokes five years from now? That’s my beef with most political cartoons, including You Said It, and Doonesbury. True, but as you might have seen, not all of them are all that oriented towards the news headline. In any case it is a cross some of them have chosen to carry, I believe. Sunile Shetty and Karishma Kapoor. I so loved Target as a kid!